The back garden never did quite get finished, and then Saturday was blissfully sunny and hot so mowing was started and that didn't quite get finished either. The news on Sunday is that it was cold, grey and grizzly and nothing much got done at all. The view from the chestnut with the big nuts. A deliberately provocative title if ever I thought of one. 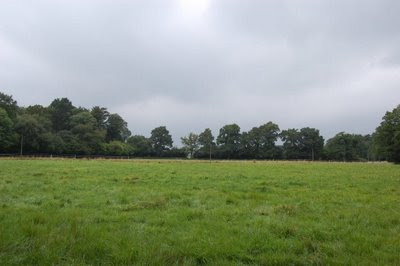 This field is usually used by a local man to graze his horses. Mysteriously this year, although he cut for hay, he hasn't actually put any horses here. I'm not quite sure what's going on, but presumably all is well. This is one of the pictures I took for the post I'd planned about the back garden. It's not very good, I still haven't got the hang of the new camera. The little Japanese maple was a present from Paul, brought back for me from Hampton Court Flower show after he'd been there with his mum. The metallic beetle is very pretty but I've no idea what its name is. Does anyone know? This is a weed that's new to me although it's supposed to be widespread in the UK. The identification isn't completely certain, the other possible ID might be Bidens frondosus but that appears, as far as I can tell from the somewhat sketchy details on the internet to be a North American species. 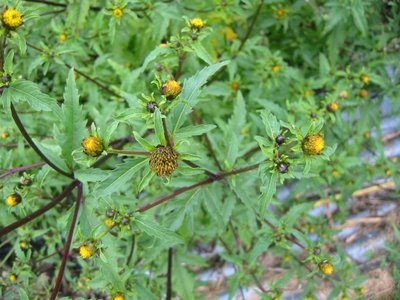 Bidens tripartita is quite a useful herbalist's plant and can apparently be eaten or used as a dye. I think it's wonderfully architectural and perfectly ornamental in the garden although I should probably stop growing it in my vegetable patch (it came in with some plug plants and was so pretty I couldn't bear to pull it up) and find it a place in a sunny border somewhere. The swallows didn't come home last night. They have been taking long trips with the babies each day for the last two weeks but have always come home to roost each night. Yesterday, with fine weather and their uncanny appreciation of the calender they went south. I miss them dreadfully. Could be a green dock beetle, Gastrophysa viridula. Shame about the swallows - there's an awful inevitability (and now, proximity) about the onset of winter. 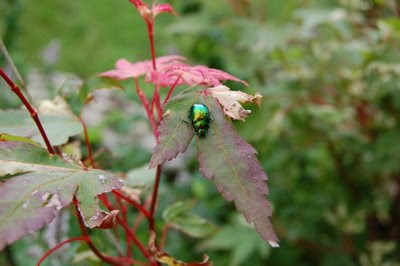 We have lots of beetles like that on our rosemaries this year.